When Sam and I traveled to Kansas City we connected with caregivers at a workshop. I was introduced to the organization Caregivers on the Homefront. What an amazing organization–filled with inspiring stories and folks. I loved spending time with them. Caregivers on the Homefront is a non-profit that has a mission. The mission of Caregivers on the Homefront Inc. is to provide caregivers of our nation’s veterans and first responders with hopefulness, a sense of togetherness, and a firm foundation of resiliency. Caregivers on the Homefront Inc. will also proudly advocate within the regional area (Missouri, Kansas, Nebraska, And Iowa) to promote awareness and increase education. Those are my kind of people. The fighters. The lovers, the ones who care for veterans (even if you are not a caregiver and you love working with and helping veterans, you are still my people). Advocating for veterans, caregivers, and the well-being of their families. I love that so much. Caregivers on the Homefront has a clear vision too. Our vision is to create a vibrant future of dignity and wellbeing for all veterans and first responder families. Redefining our countries perceptions that surround both the physical and invisible wounds of the brave men and women that serve our country and communities. I had the chance to meet an extraordinary person affiliated with this group, Shawn Moore. Shawn is a military spouse, a caregiver to her husband, an Elizabeth Dole Foundation Fellow, a thirteen-year veteran with the Kansas City Police Department, a mom (and softball mom! ), and advocate for veterans. 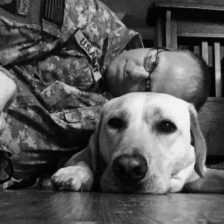 Shawn is dedicated to helping others, helping caregivers and studying PTSD. She was such an inspiration, to hear her speak from the heart and to hear her story. I’m honored to know her and proud of the work she is doing with this organization. She supports this mission of Caregivers on the Homefront, and what they do for others like: Caregivers are spouses, moms, dads, sisters, brothers, daughters, sons, and friends. Without formal training, supporting the wounded, ill, or injured veterans and first responders cannot be done effectively. (Rand Study 2014 Hidden Heroes). It is our goal to help caregivers understand their roles and teach them the necessary skills to be an effective and healthy caregiver. In addition to that, Caregivers on the Homefront also provides a holistic approach, teaching caregivers the tools that they need to survive at home. We address the physical, psychological, and social needs of the caregiver. Caregivers on the Homefront will provide in person and online social support to address feelings of isolation by increasing connectedness. We will provide training for those that want to facilitate in person support groups as well as giving them the financial means to do so. We will partner with organizations such as churches and hotels within the communities to provide space to hold the group meetings. And can I just say, the church we attended for our workshop was b-e-a-u-t-i-f-u-l. If you’d like to know more about this organization, support their mission, or be connected (becase you live in the Missouri, Kansas, Iowa, or Nebraska area, please be sure to visit their website. I promise you won’t be disappointed! There’s so much going on to help our veterans and their families. There are so many resources out there, it is simply amazing at the love and support coming from groups like Caregivers on the Homefront. These women. <3 So much love, respect, and gratefulness for them. I’m so glad our paths have crossed.